Update: Google has fixed the issues with Google Maps for Java ME and it’s working properly for new installs again. All the mobile Java versions of Google Maps have stopped working for new installs. When you try to launch Maps for the first time it starts loading the Terms of Service and then fails with the message “Serious Error. Please exit and restart.” Only new installs are broken, if you installed Google Maps before around Jan. 15,l 2013 it will still work. Google no longer supports Google Maps for Java so I doubt that they will fix it but you can report the error and request help on the Google Maps Product Forum. On CDMA QWERTY phones: lock the keyboard in number mode by pressing the Fn key twice. On iDEN QWERTY phones: lock the keyboard in number mode by doing a long press on the Fn key. The app “Mobile GMaps” (288 KB) is ready to download or send to your phone as filename: “mgmaps139”. This is the only map I have found to work on a Samsung R455c tracfone, although the search function doesn’t seem to work. 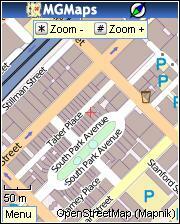 You can zoom into your area or type in directions point to point and get a map. Loads map tiles OK. Zooms OK.
Gmail still works for me. Try reinstalling. There are a bunch of Java eBook readers that can open book files stored on the phones SD card. I haven’t tested or posted any of them because my phones don’t have a memory card so they don’t work. There’s also Wattpad http://m.wattpad.com/ It downloads books from the Wattpad server and stores them on your phone. The MobileRead Wiki at http://wiki.mobileread.com/wiki/E-book_software#Cell_phones has descriptions and links (many links are broken) to over a dozen more Java eBook readers. Does not work well on the Innuendo. Map tiles do not load properly and the zoom is painfully slow. So happy that my Google Maps from a year ago works perfectly and most Boost CDMA Java phones come pre-loaded with TeleNav anyway which is also excellent for turn by turn GPS directions.